devinloves: We Signed a Lease! before, but this will be the first time we live together and the first time we don't have other roommates to worry about. 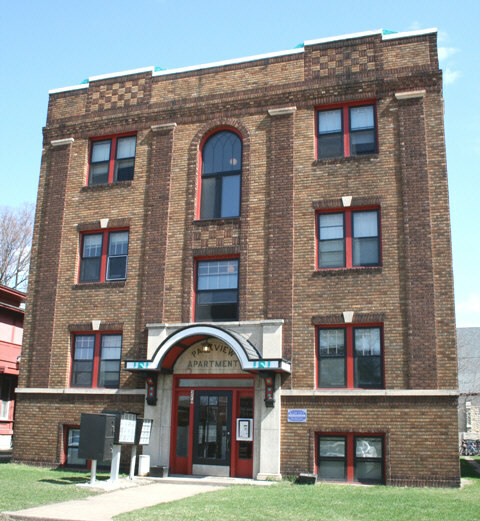 It's a tiny one bedroom apartment but it is perfect for us because we love the location (right between campus and downtown), we love that it's in an old historic building (one of the first apartment buildings ever build in Winona), and it has a roof top terrace that has the most amazing views of the bluffs, campus, downtown, and the river. Back to the tiny factor, this place is itty bitty! It's not so tiny that it won't work, but creating space for all the functions we need out of this apartment will be a challenge. The bedroom and living room are both okay sizes for what we need but the kitchen is one of the smallest I've ever seen. This is our floor plan, for some reason the oven isn't noted on here but it's across from the sink, next to the bedroom door, where there used to be a built in cabinet. I don't really know how I'll use this space successfully yet, but I've been having a blast looking at pinterest for ideas for small spaces! This is the most clever use of the awkward in-between-the-fridge-and-wall space I've ever seen! This pantry drawer is completely hand made, even though it looks store bought. It remains hidden most of the time, but can be pulled out to access the food (and the beautiful chevron print) inside. I'm thinking of all the patterns I could use for the backboard and my ideas go way beyond chevron. I was thinking of a map or newspaper print. I'm super excited to build this ( or watch John build this (: ) for my tiny kitchen. 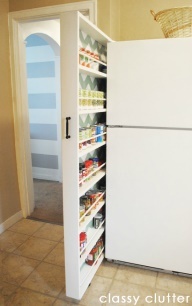 Here is the link to the tutorial by classyclutter on how to make this pull out pantry if you want to build your own. 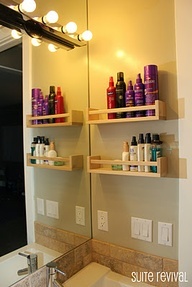 A spice rack in the bathroom?! genius! I have so many hair and body products that when I put them in drawers I constantly find myself digging through the pile for my favorites. These specific spice racks are from Ikea, but if you're like me, the nearest Ikea is a bit of a drive away. You can also find cheap spice racks at Target, Walmart, and even the dollar store. Although, if you're buying from the dollar store test the strength of them before you buy, hair products weigh more than spice jars. You can find the complete tour of Rachel's bathroom here. She has a lot of great ideas on how to organize a small bathroom space. As you can see above, we have a very small entry way to work with. Right now we both struggle with rushing through the door and setting everything down in a pile somewhere in our rooms. I have a "chair" in my room that never gets sat in, just houses a pile of jackets, scarves, and other junk that I've carried in throughout the week. 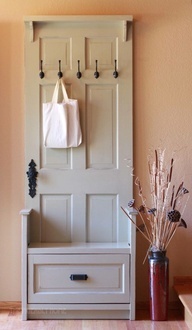 I wanted something in the entry that would help solve this problem and then I found this hall tree made from a door, it's simple, small, and efficient. I'm not sure if we'll use an old door or new wood, but this is another apartment project I'm super excited to build. You can find the tutorial here on the friendly home. And if you want even more cool apartment ideas, here's the link to my entire "make a home" pin board.